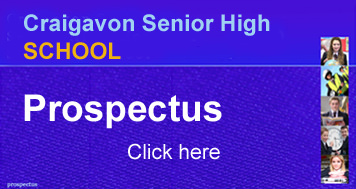 Welcome to the website of Craigavon Senior High School which should provide you with an insight to school life and allow you to keep up to date with the achievements of our pupils. Our school is non-denominational and co-educational with a pupil population of around 600 located on two campuses – Lurgan and Portadown. Both campuses share facilities with Southern Regional College and our curriculum offer is enriched through offering a number of vocational courses delivered by SRC staff. Our young people are important to us – our School aim of “Valuing Young People” underpins all of the curricular and extra-curricular activities on offer and staff work hard to provide a tailored education for each pupil and to inspire learning and achievement. Craigavon Senior High school is a place where tradition and progress go hand in hand. We place much emphasis on the traditional values of hard work, discipline and respect for self and others. We value the partnership that we have with young people and their families, and believe this relationship is fundamental to ensuring each young person succeeds. Partnerships with our local Junior High Schools and other KS4 and KS5 establishments are also important for the continued success for our young people. Our Board of Governors is committed to the school’s values and helps us to foster links with diverse aspects of the community. Additionally, our partnerships with the worlds of business and industry continue to thrive and help to provide highly stimulating and relevant learning experiences for our pupils. Our website pages can only offer a glimpse of what we can offer to pupils. We would be delighted if you wished to visit the school and to find out more about what we can offer to prospective pupils.